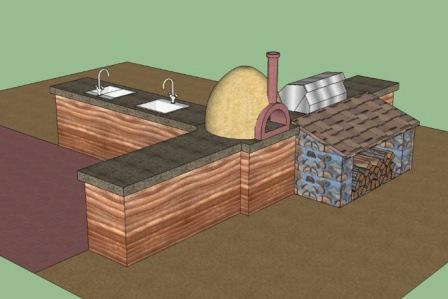 The outdoor kitchen is an extension of the outdoor classroom and learning laboratory. It is here that we celebrate the foods we planted and nurtured, and it is here that students can prepare and enjoy snacks and meals. The outdoor kitchen is the center of celebrations of harvests and school events, and the beginning of the Eating California restaurant. This area includes an outdoor grill and oven, three sinks, food preparation area, and picnic tables, which also serve as a place for journal writing. 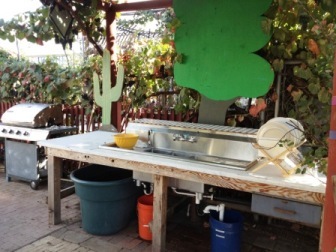 In 2012, we acquired the outdoor grill and this sink with three outlets: one for graywater, used water that flows to the city drain, recycled greywater for the fish tank. Chef John Farais has prepared many a celebratory dinner in the outdoor kitchen. Here he is with cedar-wrapped sturgeon at a spring Eco-Dinner. 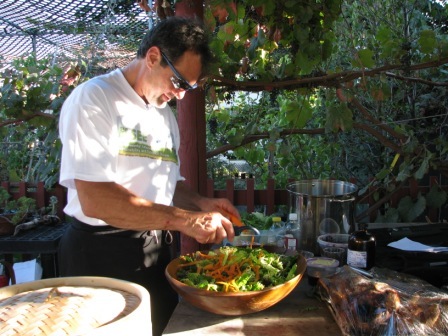 And creating a salad at a fall Grape Harvest Festival.